I've written previously about recent efforts to bring renewed scholarly attention to the Midwest. In the time since then, I've often wondered: what would a history of religious life in the Midwest look like? What already published books and articles would need to be considered and incorporated? To my knowledge, the most complete attempt to probe what is distinct about religion in the Midwest is Religion & Public Life in the Midwest: America's Common Denominator? (2004). As part of AltaMira's Religion by Region Series, editors Philip Barlow and Mark Silk put together a series of fascinating essays covering a range of topics: the Midwest as the United States writ small, the Midwest's enduring Methodist tinge, its high concentration of Lutherans, its distinct brand of Catholicism (more innovative and ethnically diverse), Chicago (need I say more? ), the diversity of religious affiliations brought about by recent changes in immigration patterns, and the contrast between urban, suburban, and rural forms of religious expression. While the essays were insightful, they were also rather short and suggestive. If you believe that considering the Midwest as a region is a useful enterprise, there is plenty of work to be done. To that end, I'd like your help developing a working bibliography. I am interested here in two things: first, what books or articles, if any, have been framed distinctively as a study of religion (or of a specific religion, religious group, or religious leader) in the Midwest. 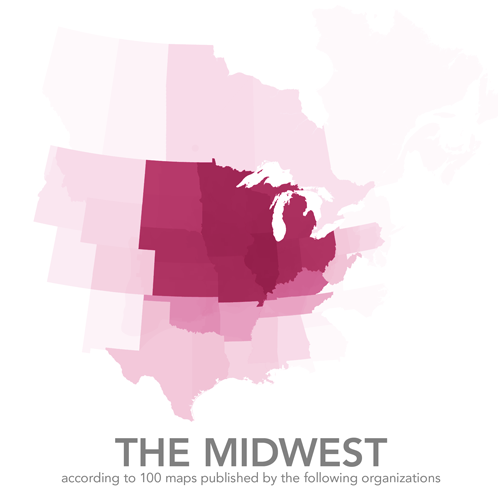 And second, among the many books or articles that are set in the Midwest but that do not purport to be studying the Midwest as a region, which would be helpful to any attempt to offer a synthesis of the history of religious life in the Midwest? In getting this list started, I've relied on the same regional definition as Barlow and Silk in their edited volume. 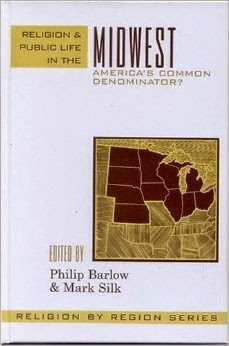 That is, I've recognized that the definition for what counts as "Midwest" is very much contested, and then I've gone ahead and included the states you see outlined on the book cover to the left. My list has plenty of gaps (hardly any pre-1970 works, nothing featuring Canada, not enough attention to various American Indian nations, etc. ), which is why I'd love your help. Please feel free to add to the list in the comments. I should also point out that although there are tons of great and useful articles in the various Midwestern state historical journals, for the most part with this list I've set those aside. But if you know of a particularly great article, please let me know. With that said, here is my attempt to get a working bibliography started, with items listed in reverse chronological order. Update: I've had a couple people reach out to me via email and twitter and offer suggestions to the list. You can find me on twitter @p_emory or email me (my gmail address is paul.putz) if you'd like. Any additions that I make to this list will be marked with an *. Randall Balmer frames the following article about Billy Sunday by trying to describe the changing "place" of the Midwest in American culture. “The Tragedy of Billy Sunday: The Allure of Populism and the Peril of Anachronism.” The Annals of Iowa, LLV (Fall 1996), 369‐373. Also, my book does not think about religion and region, but takes place in the American Midwest and deals with the history of Midwestern Mormons (RLDS). David J.Howlett, Kirtland Temple: The Biography of a Shared Mormon Sacred Space (Urbana: University of Illinois Press, 2014). Another book that is helpful is Craig S. Campbell, Visions of the New Jerusalem: Mormon Faction Interpretations of Independence, Missouri (University of Tennessee Press, 2004). This is great - thanks, Paul! I’m looking forward to checking out sources that you’ve mentioned and seeing what else others add. I have a few ideas to share. On the western edge of the Midwest you’re getting into the Plains/Western region, but it’s worth mentioning a couple of relevant projects. Nebraska’s Center for Great Plains Studies has publications that discuss religion: http://www.unl.edu/plains/publications/publications.shtml. The Department of Religious Studies at the University of Kansas has a great "Religion in Kansas" Project that features archival materials: http://ksreligion.omeka.net. David and Sarah, thanks so much for the great additions. I've added them to the list. Ya'll are definitely helping to fill in my historiographical blind spots. Also, it's great to hear about the projects at Nebraska, Kansas, and Wisconsin! John Wigger, "Ohio Gospel: Methodism in Early Ohio," in The Center of a Great Empire: The Ohio Country in the Early Republic, ed. by Andrew R. L. Cayton and Stuart D. Hobbs (Athens: Ohio University Press, 2005). Chapters 5 ("Reform and the Missionary Drive: Methodists in the Ohio Country") and 7 ("God's Chosen Sojourners: The Inspirationists of Amana, Iowa") in Scott Rohrer's Wandering Souls: Protestant Migrations in America, 1630-1865 (Chapel Hill: UNC Press, 2010). Paul, thanks so much for making this a cooperative effort. This will be of benefit to many of us. Although there is contention about whether or not Missouri is properly considered Midwest, I'd like to suggest two more books: Aaron Ketchell's Holy Hills of the Ozarks: Religion and Tourism in Branson, Missouri (Johns Hopkins, 2007) and Bethany Moreton's To Serve God and Wal-Mart: The Making of Christian Free Enterprise (Harvard, 2010). Branson, MO is viewed as a site to experience "old-time religion" for the scores of Midwestern tourists who make a yearly pilgrimage there (including my parents!) The early days of the Wal-Mart story is also instructive about Evangelical populism and commerce in the Midwest. I know I'll have more to suggest later! Wow! Great list, and I'm honored to be on it! 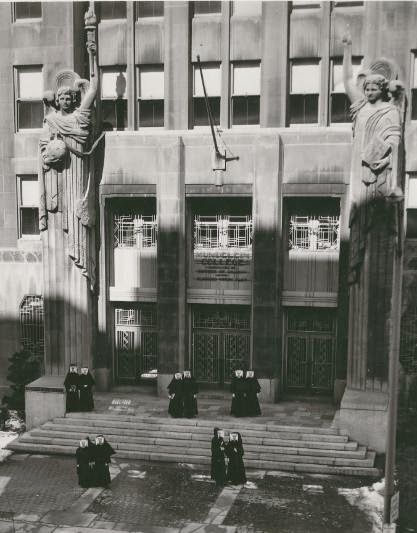 Hundred Years of Religious History in Detroit” Michigan Historical Review 21:7 (Spring 2001): 1-32. “Religion in Michigan,” The American Midwest:Religion. Peter W. Williams (ed.) Columbus, OH: Ohio State University Press, 2003. The Midwest, Joseph Slade and Judith Lee (eds.) Westport, CT: Greenwood Publishing, 2004.
of Religion in America, Charles Lippy and Peter Williams (eds.) Washington, DC: CQ Press, 2010. More great recommendations, thanks all! I've added them to the list. Barton, I couldn't find the existence of a book titled _The American Midwest: Religion_ anywhere. I did a few google searches, checked the Ohio State UP website, and Amazon, but nothing turned up. Do you have a link you could point me towards? The work of William Warren Sweet would be helpful for the migration of American religious groups into the Midwest, especially Indiana and Ohio. He edited a 4 volume documentary history of "Religion on the American Frontier" (a volume each for Baptists, Methodists, Presbyterians and Congregationalists). The correct citation for those three encyclopedia articles by Brian C. Wilson that Barton referred to is: Richard Sisson, Christian K. Zacher, and Andrew Cayton (eds.). The American Midwest: An Interpretive Encyclopedia. Bloomington: Indiana University Press, 2007. (My bad, not Barton's.) The Encyclopedia has an excellent section on religion in the Midwest edited by Peter Williams. Thanks to Barton Price for the initial post, and thanks to Paul Putz for creating this bibliography! Thanks Jedidiah. That helps to fill in the "pre-1960" gap a bit! Brian, thanks for clarifying. I've added the Encyclopedia to the list. Dutch Calvinism in Modern America: A History of a Conservative Subculture, James Bratt (Eerdmans, 1984). Dutch Chicago: A History of the Hollanders in the Windy City, Robert P. Swierenga (RCA, 2002). Family Quarrels in the Dutch Reformed Church of the 19th Century, Robert P. Swierenga (RCA, 1999). Divided by a Common Heritage: The Christian Reformed Church and the Reformed Church in America at the Beginning of the New Millennium, Corwin Smidt, et al. (Eerdmans, 2006). A History of the Evangelical and Reformed Church, David Dunn, et al. (Pilgrim Press, 1990). The Shaping of the United Church of Christ: An Essay in the History of American Christianity, Louis H. Gunnemann (United Church Press, 1999). Looking forward to reading through this bibliography closely, Paul, and hopefully contributing a few titles. Thanks for putting it together! This is really great. I'm developing a new class next year on religion in gilded age Chicago, and there is a lot here that will be useful for me. I recently wrote a paper on black churches on Chicago; perhaps some of sources could be useful for this list. Harris, Fredrick C. “Black Churches and Machine Politics in Chicago.” In Black Churches and Local Politics: Clergy Influence, Organizational Partnerships, and Civic Empowerment. Edited by R. Drew Smith and Fredrick C. Harris. Lanham: Rowman and Littlefield, 2005. Harris, Michael W. The Rise of Gospel Blues: The Music of Thomas Andrew Dorsey in the Urban Church. New York, Oxford UP 1992. Hope some of that was helpful. Fantastic stuff. Thanks Daniel and Nicholas. Ben, I wish I could enroll in your class! One of the joys of teaching at a small liberal arts college is the freedom to develop and teach new courses. As I work up my bibliography, I'll come back and post whatever else I find to this page. Richard Seager's *The World's Parliament of Religions: the East/West Encounter, Chicago, 1893* should definitely be on the list as well. Sounds great. I'll keep tabs on the comment page so I can keep the list updated. Good call on Seager's book. Excellent example of how focusing on the Midwest need not preclude the transnational or global.